GIRI PRADHAKSHINAM – an experience…. 22 Dec 2009 Comments Off on GIRI PRADHAKSHINAM – an experience…. A WALK WITH THE GODS! Girivalam – 14th. December, 2009 – 3:51 a.m.
அற்புதமான காட்சி அருளும் என் நாதா! சூக்ஷ்மத்தில் (தற்போது) சிவனாக இருப்பவனே! பரிபூரணனே! No temple is dearer to my heart than the Arulmigu Sri Arunachaleshwarar Shrine at Thiruvannamalai. I say this because of a very special feeling this temple has evoked in me. I have visited several temples in TamilNadu, but never have I been drawn so magnetically, to a sacred space, like this one! Each time, I return from Thiruvannamalai, I do so, with a heavy heart, yearning to go back there… Every visit to this Divine temple, has left me with a soul-stirring feeling, that lingers for a long time in the innermost sanctums of the heart… a yearning to return, to seek the warm nest of Home…to my Lord, my Master! மாதா, பிதா, குரு, தெய்வம் – my parents, my Master, my Lord! சிவ சேஷா, சிவ சேஷா, சிவ சிவ சேஷாவே! My recent visit to Thiruvannamalai was a very special one, since we were graced by the Lord, that we could go on a Giripradakshinam, guided by Our Guruji! During the pristine hours of the Brahma Muhurtham (the auspicious time between 3 a.m. And 4 a.m.), on the morning of 14th. December, 2009, we followed the footsteps of our Guruji, Sathguru Sri Rajalinga Swamigal, on the holy Pradakshina of the sacrosanct hill, Arunadri, where Our Mahaan resides! With Mahaan’s Mantra (the essence of Arunachala) in our hearts, and the benevolent grace of our Guruji, and the grandiloquent Arunadri, by our side, the grace of Our Lord was palpable, with a warmth that was so moving. This magical warmth, intensified my faith, courage, determination and our love for our immaculate Seshadri Natha! Passing stretches of well lit wide open expanses, there was a short stretch of road, with shaded canopies, that we had to pass. It was pitch dark, and we held on to the light of the Maha-Deepam in our mind’s eye. Wondrously, it felt like we were walking into our innermost recesses of our hearts! It was a short stretch of road to self-analysis, before we would see the Holy light again! It felt like we were walking into the garbha-gruham (sanctum sanctorum) of the shrine, to find the “Apraakrutha Tejomaya Lingam – Mahaan Sesha”, at the end of the passage! It was a humbling experience to offer our little prayers to the colossal Arunachala Shiva – Sesha – the effulgent Lord, who had assumed here, such magnificient proportions, to bless this world, and rid it of darkness. What a beautiful verse, to describe the beauty of Shiva! With the break of dawn, the golden glow of Arunachala sets your heart on fire, with unceasing passion for the resplendant Lord! First, we approached the Samadhi of the Holy Isakkiya Siddhar, a saint who had extraordinary powers. He would sit and gaze at the Sun God, all through the afternoon hours, without a blink. 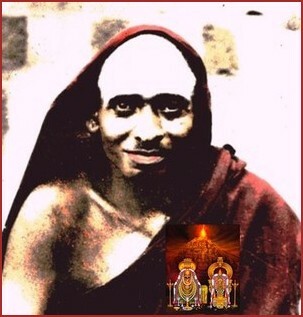 He had graced the Holy Mother Uma Deviar, with a vision of what Arunadri looked like. He had performed an anga-pradhakshinam (circumambulation, prostrate on the ground), a thousand and eight times, around the Divine Hill! Guruji explained to us the significance of the various facets of Arunachala. From this spot, we could have a Panchmukha darshanam of Arunadri – the view of the five peaks of Arunachala. The five peaks (from left to right), constituted – Lord Chandikeshwarar, Lord Ganesha, Lord Subrahmanya, Lord Shiva and Goddess Parvathi. As we continued, our spiritual experience was blessed by the Divine Gods! Fragrances of karpooram (camphor), agarbatthi (incense), ghee, flowers, vibhuthi (sacred ash) and chandanam (sandalwood), began to emanate from the Holy Hill! They continued to linger, every few minutes. We also felt the fragrance of a Homam being performed! As we walked on, we were awe-inspired and overwhelmed by Guruji’s narration of the innumerable accounts of grace showered by Para-Brahmmam Seshadri Swamigal, on His devotees, and His blessings on them, through His leelas (miracles). What words could describe the love and compassion Sesha Mahaan had, for His Bhakthas (devotees), – Sesha Bhagavan is the Lord of the Lords! உன் பாதம் பற்றினால், ஸ்ரீ சேஷா! Different manifestations of the Devas, and the Siddhapurushas, through the different fragrances, are the blessing(s) of the Gods! When man circumambulates the Holy Hill, clock-wise (Pradhakshinam), the Gods of the Heavens, and the Heavenly Beings, descend on their Giripradhakshina, in an anti-clockwise (Apradhakshinam) direction. They then shower their bounty and grace on the mortals, in the realm of Lord Shiva. Never can there be a soul who is not brought back to this sacred soil! The warm rays of Arunachala Shiva stretch to the limits of the skies and the seas, – one cannot ever forget this shrine on earth! Girivalam in this miraculous kingdom of Lord Shiva, transports one into higher realms of thought and feeling, and transforms our souls! Walking further, we saw how, from a different angle, the Hill revealed two prominent peaks – one representing Lord Shiva, and another, Parvathi Devi. From yet another angle, further down the road, these two peaks merged into one – symbolizing the Divine union of Shiva and Parvathi, the union of Paramathma and Jeevathma, the essence of Advaitha. Could there be more wonderful and holier ground in all of creation! Visting the eight Lingams on the Girivalam path, we finally came to the shrine of the “Isanya Lingam”. Guruji explained that ‘Isanyam’ (the North-Eastern direction) was the direction of the Gods, and at this spot, gather all Gods, to shower their grace on humans. Prostrating to the Lords, at this spot, would be a high blessing to our souls! We were very fortunate to have a Darshanam of the Paal Abhishekam (the annointment with milk) for the Isanya Lingam. Further in our pradakshinam, Guruji showed us the Samadhi of Isakky Gnaana Desikar, a staunch devotee of Sri Arunachaleshwara. There was always a crowd of devotees thronging to see him. He used to flee to the forests, to perform his penance undisturbed. Once he was even pursued by men to the forests. Lord Arunachaleshwara and Goddess Apeethakuchambal came to his rescue. They assumed the form of lions, guarding him from the rest of the world, for his undisturbed meditation! Such is the glory of Sri Arunachaleshwara! As we proceeded with Guruji, we had a glimpse of the Skanda Ashramam, and the Virupaksha Cave, where Ramana and Para-Brahmmam Sri Seshadri Swamigal spent their hours in meditation. Guruji also elaborated the tale of a saint by name, Guru Nama Shivaya, whom, Lord Arunachala and Goddess Apeethakuchambal came down to earth, to shower him with their ‘leelas’ (miracles) and ‘prasaadams’ (blessings)! In the final stretch of the pradhakshinam, we had a view of all the four main ‘Gopuram’ (portals), of the Arulmigu Sri Arunachaleshwara temple. We soon reached the Ramana Ashram, from where we had started. With the grace of Sri Arunachaleshwara, the grace of Mahaan Seshadri Swamigal, and the grace of Our Guruji – Sathguru Sri Rajalinga Swamigal, we completed the Giripradhakshinam. The most amazing experience was yet to come! We were soon back in our rooms, rested after taking in the beauty and grandeur of the Kingdom of Lord ShivaSesha! After about an hour or so, suddenly we could feel the scent of camphor! Guruji had told us earlier, that the fragrance of camphor, meant a blessing of Sri Arunachaleshwara Himself! The scent of camphor was stronger now, and it soon enveloped us. (The fragrance of camphor, lasted , intermittently, for 3 whole hours, in our room!) We we at a loss for words, to describe our feelings! SeshaBrahmmam had been with us! உன்னைக் காண கண் கோடி வேண்டுமே! We could say and feel nothing, except our gratitude to the Lord, who willed to stay with us! சிவ சேஷா! சிவ சேஷா! சிவ சிவ சேஷாவே! “சேஷா ! என் உயிருக்கு உயிரே! 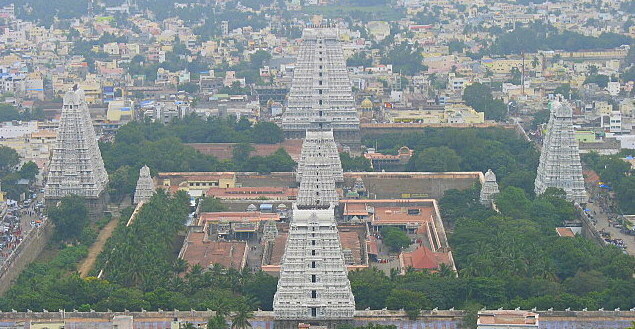 Till I finished reading word to word of this magnetic power of girivalam, you made me feel as if i was also transported with you, with retrospective effect, for the holy Giri pradhakshinam – indeed the very manifestation of Arunachala. Pray for me that i too shall be drawn under the compassionate wings of Mahan Sathguru Sri Sesha Brahman and get the golden opportunity of one life time to physically circumbulate the the Holy Arunachala.